Re-purpose all your Customer Services as a relevant Brand, which fortifies Customer emotions and perceptions with meaningful interactions. moments, and experiences. You can agree, or disagree. But when was the last time, that you’ve surveyed your Customers? For years, Marketing organizations in all industries were accustomed to survey specific perception, usage, or business issues and then responded with some tactical activations, to correct the issue at hand. In the same pattern they were making target-audience assumptions, and in general were addressing mostly the customer profile, which was broad (men-women, age, usage pattern, geography, some habits). But it’s no longer enough to make generalizations about who we think our audience is. It’s primarily about listening to what the data (offline vs. online sales’ leads, web actions, call centres and customer surveys, automated consumer panels or testers, sentiment and figures on social media, reach and engagement) reveal. Tough isn’t it? CEO: what drives brand performance? Marketing & Communications were for years following the age-old practice of defining the “buyer’s persona”. Although the aim was to find and connect with Customers, you can’t imagine how many biases were taking place. Now with data at the heart of planning and learning, Marketers can really create personalized campaigns. We think that if you’re a company that is still building user profiles only based on focus groups or U&A’s you’re simply targeting wrong. If you love your Customer, prove it in Service (excellence). Go from an offline research-backed profile and mere demographics’ cliche to Insights. Start connecting with the people who are most likely to engage with the service/product. Collect insights from ‘hostile’ groups, competition, industry trends. Check for Insights to improve your Marketing and Communications. What’s hidden in people’s mind? Which trend can you exploit, instead of ‘bombarding’ them with rational benefits, or (even worse) emotional claims that they are indifferent of? In the current Transformation, the imperative is turning in new paths. Disrupting the Customers’ expected ‘routine’ (yes, they have seen it all!). See the below example of Apple, turning back your device to recycle it. Is it a ‘marketing gimmick’ or a true (new type) customer offering and service coming out of real, human insight? The example of Apple below says it all. There is a major wave of recycling-friendly communities; many countries try to resolve their waste management issues; hundreds of companies try to handle their returned-products. So, there a responsible proposition and a Customer-centric one! From insurance to ad agency. From retailer to a small shop owner. From an app creator to a personal service. Go through your Customer’s journey. Think brutally what you do, and what’s not relevant (or distracting). Think of your Customer’s angles, worries, and needs. Amazon’s new Alexa can give you a stimulus, of how the world of services will look like in a few years forward. The Amazon’s new ‘Alexa Blueprints’ let anyone create custom Alexa skills and responses! So, your Customer someday will be able to “train” a machine for his needs and search actions! Check the 22 Customer support statistics, to get some stimulus. Don’t ever forget: only the 4% of Customers usually post their complaint; the 96% clicks/goes-away silently and furious. The customer is bored, or sometimes, angry! In an incredibly fast-paced and ever-changing world where consumer choices are rapidly expanding and customer expectations are constantly increasing, surprisingly many business owners still need to be convinced that improving customer service and customer experience is essential and can lead them to increased customer retention, brand loyalty and more revenue. On the other side, just a single poor customer experience can easily break customer relationship and have a negative impact on brand reputation and the bottom line, as the voice of the customer has never been louder. 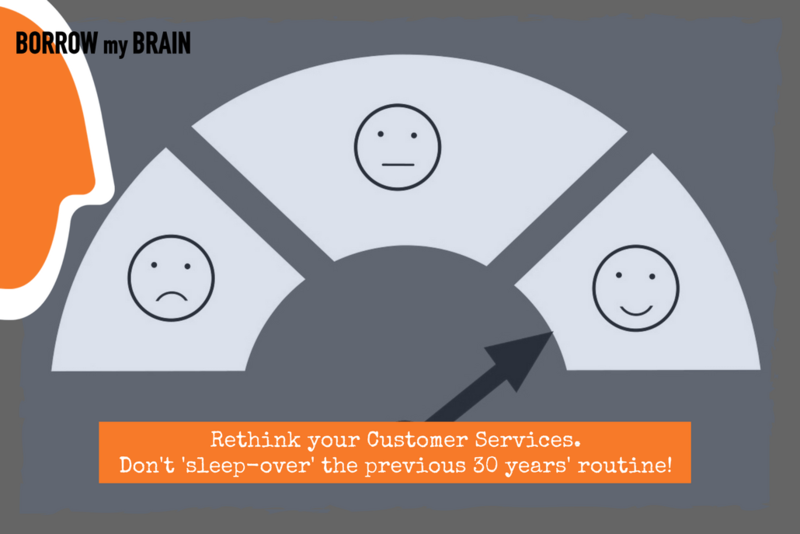 That’s why downplaying the importance of customer service and customer experience is no longer an option. Starbucks sells coffee. But people love it for its bigger ambition, to inspire and nurture the human spirit, one person, one cup and one neighbourhood. It is about a strategic mission to have shared values. They know that it’s the people drinking their coffee who make them what they are, and this shared purpose creates common grounds. It gives customers and employees rational and emotional permission to build relationships that go beyond the next transaction. Think of the way Disney keeps making visits to its properties more magical, by using technology to help guests unlock hotel rooms, make a playdate with Snow White, or even pay for a turkey leg. Or think Spotify’s ability to follow you on-the-go, or into an Uber, work with Tinder and Bumble to help you find better dates, and cranks out playlists made up of songs you’ve never listened to but instantly love. Customers are fiercely loyal to relevant, living, and quality experiences: When Samsung faced the massive recall of its Galaxy Note, everyone expected customers to defect in millions. The brand’s mobile phones have come back stronger than ever, precisely because people love the way they perform across devices, including smartwatches, tablets and increasingly, virtual reality. What Services should you improve? Google business: Update immediately and accurately all of your Google business data. Upload photos, posts, and allow Customer reviews, that will be a constant alert of how you’re doing on service, price, offering. Give them the ‘live’ access to a phone call, e-mail, and help them how to reach your business. Have a person assigned to look after requests, reviews, and comments. Growth marketing/Online: Decide your online Sales funnel right away and build your web presence on it. Where do they find you, which is your campaign offering, what do they buy, how many details they need to know and be convinced, what do they download, observe how much % of visitors is converting and what do you need to constantly improve. Website/landing pages: Clarity. Make specific claims that are proven by facts. Clear out your landing pages on the website or the e-shop from all the unnecessary blah-blah! Less is more! Open up the ‘live’ chat option for those that wish to ask you more. Offer them a ‘hotline’ (for the time being), until you have (in a few years) your chat-bot ready. Permit post reviews, comments, and respond to all; every review can turn into a sales opportunity. Returning e-mails: Some e-shoppers already have activated on Amazon Web Services and they send you automated e-mails for all the purchase process. But they never respond in time when they get a complaint or a question. “Contact our support centre” is a big Brand promise, that when is broken, you can’t fix easily. ERP / CRM process: Have an updated records’ list for wishing Customer birthdays. Segment your Customers in product/service while mining into their needs and insights so you can offer personalized post-purchase customer service. Yes, even one telephone call every three months will do! Ask for feedback. Sales aren’t automatically a repeat process on its own. Customer Value Optimization policy & Customer Lifetime Value: Train your people, salesforce, and IT/data systems for the Lifetime value of each Customer (how much has contributed, how important is this one or group of Customers). Update these statistics often, to realize where your business stands. Then, decide how to optimize your Customers (dormant, indifferent, loyal) and what add-on value exchanges you will offer and what feedback mechanisms you’ll have in place. Train your employees, 24/7/365: Do it for all touchpoints, off-and-online, for all customer-facing teams. You can’t lose any Customer or be permitting negative word-of-mouth. Courtesy, politeness, tension and conflict avoidance, patience, the skills of learning the Customer and speaking techniques are the ‘soft skills’ your staff needs to have. As many new recruits you have in the company, the more you should increase your training budget. Rewrite all of your Customer policies, scripts, and processes: No exaggeration! Most of the Customer policies have been created -in legacy companies- years ago and even if we do a new venture ourselves today, we most probably repeat those. That’s not enough! Rework your Service items, having in mind a very basic Customer journey for your business, either online, physical store or service (B2B). Some brands have become part of our daily life so seamlessly that we don’t even think about them until something goes awry. These brands represent more than a product or service we buy–they’re an integral part of our lives. Achieving this level of relevance is no easy feat given the current state of brand-building. For one thing, customers are more in control than ever, and their expectations of brands continue to rise. Technology, from mobile to wearables to Internet-embedded homes, further disrupt those expectations, allowing people to perceive and interact with brands in new ways. Brands that aren’t evolving get lost in the shuffle. How do you build Brand Relevance? Relentlessly relevant brands can drive change and quickly turn new ideas into reality. They empower diversity of thought, customer centricity, collaboration and agility. Many “Clients” often attribute business success to the founder, the price, the offer, the competition, or a trend. This has been proven wrong! Relentlessly relevant brands are those thriving brands, which fortify Customer emotions and perceptions with meaningful interactions, moments, and experiences. You can agree, or disagree. Words are easy, you can say. But it worths to implement a multi-channel Customer survey (as a Satisfaction Index), so you know where your brand name stands and what do you need to improve. When it was the last time, you’ve asked your Customers?